Here comes "This Week's Play" with Jack Benny and all the gang! Mary Livingstone, Phil Harris, Eddie "Rochester" Anderson, Dennis Day, and Don Wilson all play their parts in parodies of Hollywood movies, wild Westerns, murder mysteries, and more. 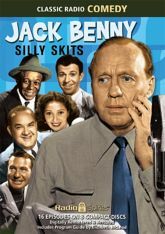 Kick back with sixteen satirical skits in this collection of classics from the 1940s and 1950s, featuring guest appearances by Barbara Stanwyck, Oscar Levant, Charles Farrell, Sam Goldwyn, Frank Sinatra, and George Jessel!